The eWON Talk2M industrial connectivity product has received cyber security certification after assessment and pen testing. HMS Industrial Networks has announced that its remote connectivity product, eWON Talk2M is now ISECOM STAR security certified. The eWON Talk2M remote connectivity service is a key element in eWON remote products from HMS Industrial Networks. Talk2M offers users a secure remote connection to industrial equipment via eWON industrial routers. Accordingly, Talk2M is regularly tested by independent companies to maintain a high security level in today’s fast-evolving technology environment. 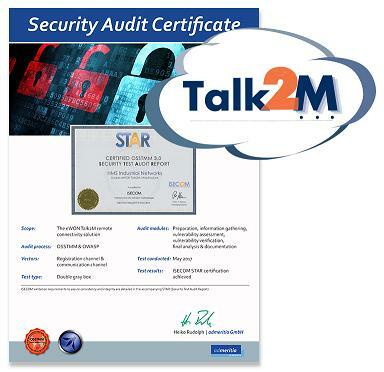 HMS has announced that Talk2M has become ISECOM STAR certified after passing an assessment performed by the company admeritia GmbH, a vendor-independent German cybersecurity company specialising in IT security assessment (ethical hacking) and KPI-based security measurement. The assessment was carried out through an OSSTMM 3.0 and OWASP audit process, which included penetration tests of Talk2M targeting the cloud-based infrastructure. EWON Talk2M is available in the UK from Industrial Data Communication and M2M specialist M.A.C. Solutions.